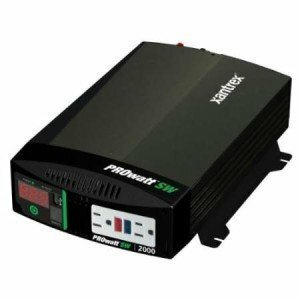 The Xantrex PROWatt 2000 Inverter is exactly what you’re looking for if you want a streamlined unit at a reasonable price. For whatever your 2,000 wattage needs are, this device won’t disappoint. As the name suggests, this unit is good for 2,000 watts of power, which is pretty impressive considering most devices that can do the same are a whole lot bigger. This is true sine wave power too; you’re looking at 120 volts at 16.6 amps max coming from a brand we have a lot of positive experiences with. When you take a look at the electricity this inverter can produce, it appears similar to, or even better than, the type you’d get right from your utility company. Its wave form moves with easy and is almost completely free of any type of frequency harmonics that won’t upset its consistent flow. Xantrex is known for making small, compact units and this machine is no different. Nonetheless, it’s perfect for your aquatic needs, if you’re looking for an inverter to help power up all kinds of electrical loads and even your RV products. Thanks to its compact size, you’ll have no problem keeping it in any type of marine vessel, car or truck, RV, commercial vehicle, etc. However, due to its consistent output, you could just as easily use it for microwaves, power tools and more. It’s just short of 11 pounds and is 17 inches by 14 inches by 7 inches. So, again, storage won’t be an issue, neither will carrying it around to wherever you need it. Aside from its wide range of uses, you can also rely on the Xantrex PROWatt 2000 Inverter to work in all kinds of conditions. It’s been tested at and worked fine in temperatures as low as -32 Fahrenheit, making it perfect for those ice fishing expeditions you’ll be out for hours doing. It can also operate just fine if temperatures get as high as 104 Fahrenheit. The user friendly display on the side makes it extremely easy to use. There’s no mistaking how much power is being put out and at what rate. There are two outlets on the side, making it possible to charge a number of units all at the same time. Plus, this device is USB-friendly too, which is a nice, modern feature more inverters should really come with. A number of safety features also come with this instrument and ensure that power levels are always kept far from dangerous. Furthermore, protective measures like low voltage alarms, low voltage shutdowns, over voltage protection, over temperature shutdown, overload shutdown and GFCI protection all go a long way toward keeping this unit a safe choice you don’t need to worry about. We’ve seen this unit go for over $500. While that is reasonable for the power and features you get, don’t pay that much! We’ve done the hard work for you and found it online for less than $400. That is an excellent price for such a power-heavy, reliable unit that can convert electricity and produce a sine wave better than what most utility companies can do. Plus, Xantrex made it plenty heavy duty so it will be just at home installed in your big rig as in the back of your boat. It’s tough to find anything bad to say about the Xantrex PROWatt 2000 Inverter. It brings a lot to the table, but still leaves plenty in the bank.